This past weekend I took my daughters on a trip to Palmetto State Park. I had done this a few year ago (and even wrote about it for on Lake|Flato's blog) but back then I just had the single daughter which made the logistics of the trip a little easier. Still, the interpretive trail was the perfect length for a four-year-old (Sammy) on foot and a one-year-old (Darcy) in a stroller. The swampy landscape and dwarf palm plants - hence the name, "Palmetto" - that define the park's landscape were just as fun then as they were back in 2012. The architecture was just as fun as well. The park's main gate, refectory, water tower and various other structures were all built by the Civilian Conservation Corps, in the 1930s. The architecture of the CCC was the result of a unique circumstance where labor was cheap and in abundance but materials were expensive. This inverted the usual equation that defines how buildings are built. In the case of the water tower, large boulders were gathered from around the site to act as a foundation upon which the rest of the stone structure was laboriously piled. The use of local materials in this way certainly gave the building a rustic appearance, but it also allowed it to be perfectly integrated into its surrounding landscape. 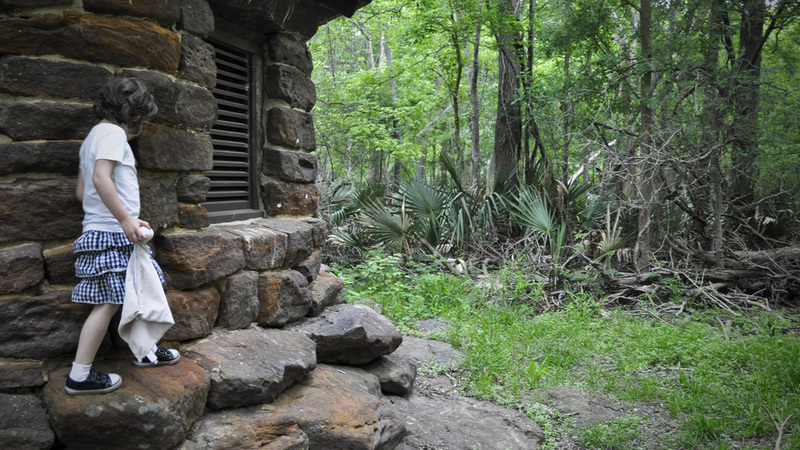 The CCC structures in the park seem to belong there in a way that buildings rarely do. It should be noted that this type of rugged stone masonry also allows the building to be climbed in a way that Sammy truly appreciated. All buildings should be this much fun. All buildings should be this good.